Greenfield School, first established in 1894. 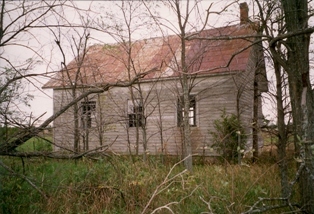 Shown here after 2001 restoration. 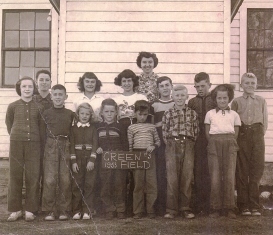 Greenfield School was situated on the north end of lot 20, concession 5. The land was originally given to the trustees of School Section 17 in 1855 by David Grier and his wife Mary. The deed, however, was not drawn until Jan. 11, 1885 and not registered until March 2, 1860. Price paid was five shillings of lawful money of Canada. to have been John Leach. The boundary of the school section extended from the line between the townships of Escott and the Front of Leeds and Lansdowne westward to and including the Steacy farm. 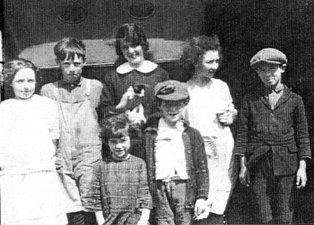 Traditionally though, the children from Warburton General Store attended Greenfield, but not those from Warburton Cheese Factory next door. North limit was concession 6, while the south boundary was in general the south end of concession 5. At some time before 1877, the section number was changed to S.S. #3. The present building was built to replace the log structure. The date,unfortunately, is not known. Before the building of Greenfield's churches in 1890 and 1893, church services were held in the school. 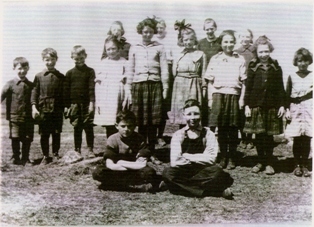 In 1948 the Township School Area was formed. It is interesting to note that 2 of the 5 members were from Greenfield, Mrs. L.B. Webster and Arthur Horton. * Article compiled from a report written by Bernice Horton and material in Society files; appeared in our November 1999 Newsletter. 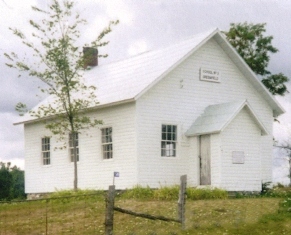 S.S. # 3, Greenfield, is the only one room school house left in the township which has not been demolished, altered, renovated or converted to some other use. Gone are the desks, furnishings, books and pupils, but the building sits empty just as it did when it closed in December 1962. The years have not been kind to the building. The initials of former pupils carved into the back wall, however, are still clear. Part of our society's mandate is "to promote an awareness of the historical past - - - and its importance to the development of Ontario". In keeping with this, the executive felt this last piece of local educational history should be preserved. 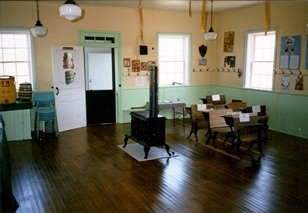 On behalf of the Historical Society, the executive has entered into an arrangement with the Grier family to refurbish the building and have the use of it. Our first priority this fall is to clean out the building (it was used to store hay) and close up the windows to prevent further damage to the interior. Next spring a programme of restoration will begin. The grounds will be cleared and the grass cut. The building will be painted inside and out in its original fashion. Windows will be replaced and the floor repaired. This project has received considerable interest among former students and teachers we have talked with. Several are working on lists of former classmates. A committee will be named to compile a list of names and addresses of past students and teachers. If you attended Greenfield as a pupil or can help with a list of names, please contact us. We would also like to collect anecdotes of your experiences at Greenfield. September 10th dawned clear, sunny and warm, a perfect day for the Open "School" House at the refurbished S.S. #3 Greenfield School. 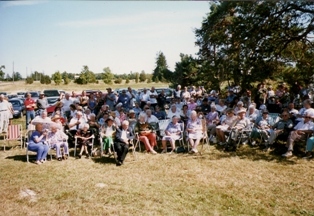 Over 150 former students and teachers, as well as Society members and friends attended. This project, titled "Greenfield 2000", began as a Millennium Project in 1999. Funding under the Federal Government programme was not forthcoming, thus local fund raising and volunteer labour was necessary to bring the project to completion. Many hours of dedicated labour went into the cleaning and repair of the building and grounds. To try to name all who worked so hard would be impossible, thus a big "THANK YOU" all. 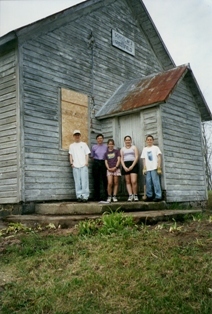 The local Heritage 4H Club has been a participant from the start. 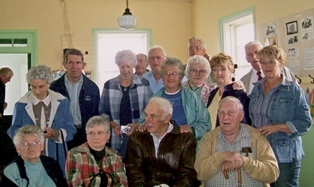 The Society recommended to the Township of Leeds and the Thousand Islands Council that the Club be nominated for recognition by the Ontario Heritage Foundation as part of the Young Heritage Leaders 2001 programme. Their volunteer activities fell under the services at a museum or historic site. County Warden and Township Reeve Harold Grier presented the certificates and pins to members of the Club. Four former teachers attended, Mrs. Lydia King ( Hutcheson 1940-42), Mrs. Beth Good (Stout 1945-47), Mrs. Wilma Hartley (Steacy 1947-49) and Mrs. Ethel Adams 1955-56). Mrs. King and Mrs. Adams cut the re-opening ribbon which was held by Andrea and Josh Grier, sixth generation of the David and Mary Grier family who donated the land originally in 1855 for a common school. Dempsey (Moorhead) spoke on behalf of her classmates, the last class in the school when it closed in 1963. The afternoon was spent meeting former classmates and teachers and recalling their days of glory at Greenfield. Refreshments, including a cake with a picture of the school, were served by the committee. The Society has moved its collection of artifacts into the building. * Article written by Bill Boulton and published in our Fall/Winter 2002 Newsletter. The happiest years of my youth; seven as a pupil and four as a teacher; were spent under the roof of our public school at Greenfield, S.S. #3. What an appropriate name for a country school and a countryside! In the spring, the golden dandelions amongst the green grass and trees were a delight for the eyes on the walk to school in the morning. This school was attended before me by my father and uncle. 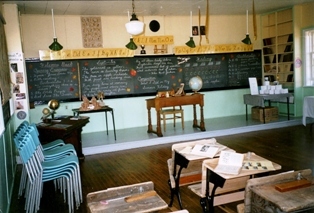 It was a one-room log school in the beginning. 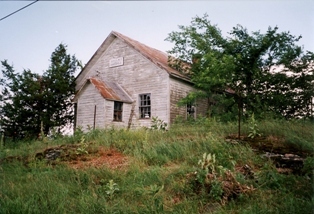 The present building is clapboard on the outside with a metal roof, new windows, chimney and a porch. When I was six years old, I started to this school with Miss Hazel Haig as my teacher; who, by the way, was boarding at my home. I was scared to death that first day, I well remember. My mother walked me to school that morning in my new dress, hair bow and sandals. My brother was still too young to accompany me. I chose a seat on the right side of the room under the octagonal clock on the wall. I placed my dinned pail on the back bench. Some of the teachers who taught me were: Miss Nelly Taylor, Miss Hattie Cochrane, Miss Seal and Mr. Mackenzie. I met my first love in Senior Fourth, and I'm sad to say we are the only two left who attended in 1925. My four younger brothers attended this school also. My best friends in life were made there: Edith and Clark McCready, Laura Sales, Mae and Anna O'Grady, Emily Grier, Gerald and Harold O'Grady. Never did I imagine that one day I would be a teacher in that school! I always wanted to be a nurse and live in a big city. I had to write my Entrance Exams for two days in Lansdowne to pass into Continuation School. I stayed with my paternal grandmother and successfully passed all the subjects. My two other classmates also passed. As I was too young to leave home, I took piano lessons from Maggie Webster to obtain my Grade Two in theory and piano. Then I spent four years at Lansdowne Continuation School to obtain my grade 12. I was 17 and ready to train for a nurse, I thought. My father informed me one day in August that I was going to be a teacher like my mother, and that he was sending me to Ottawa Normal School in September 1930. He sold his best cow to pay for my year there, and it had to be repaid later. I very sorrowfully attended Normal School and hated every minute of it, as it was not my wishes. When I finished the term, I could not get a school, so I spent another year at home available as a supply teacher, but no supplying to do. As my father was a trustee of Greenfield, I was hired when a vacancy came up, as a teacher and janitor for $475.00 for the year 1931 - 32. I boarded at home with my family. I had to teach my two younger brothers, my first cousin, other cousins, and my neighbours' children. This was a difficult situation. However my mother was a teacher and she straightened me out with a timetable and good advice so that things fell into place as a result. My first day of teaching I shall never forget! At 9 a.m. I picked up the brass hand bell off my desk and walked out to ring it at the porch door for the children to line up on the rocks. The children came running from all directions. The smallest little boy, a beginner, fell down with his slippery leather shoes and cut his face on a sharp rock at the door. Blood was all over the place! Here I was with no first aid supplies, no telephone and a child bleeding to death - my first cousin at that! I ordered the oldest lad to run to the nearest neighbour to call for his father to come to the school. In the meantime I held the bleeding boy in my arms and pressed my scarf on his wound until his father arrived to take him to Dr. Lochead to be sewed up. Eric still has the scar on his chin. I cleaned myself up as much as possible and after awhile got the children organized for the first day. That year I had 8 grades and 2 pupils in Grade 9. * This article appeared in our Spring/Summer 2001 Newsletter.